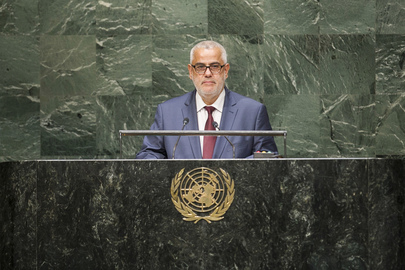 Below is the full text of the speech delivered by Moroccan Prime Minister Abdelilah Benkirane on behalf of King Mohammed VI to the 69th session of the United Nations General Assembly on September 25. Prime Minister Abdelilah Benkirane delivered a speech on behalf of King Mohammed VI. It gives me great pleasure to take part in the Sixty-Ninth General Assembly of the United Nations Organization for which, Mr. Chairman, you have suggested “Sustainable development in the post-2015 development agenda” as the central theme. This is a pertinent choice which is fully in line with our Organization’s priorities, especially as it encompasses economic, social, environmental, security and political considerations. I have therefore decided to devote my address to this important topic, knowing that the Kingdom of Morocco’s standpoint regarding other items on this session’s agenda will be presented during the General Assembly committee meetings or at the ministerial meetings which will be held on the sidelines of the General Assembly. Achieving sustainable development is one of the pressing challenges facing mankind. It is particularly important, in this respect, to strike a balance between the requirements for economic and social progress and the protection of the environment, on the one hand, and the safeguard of the rights of future generations, on the other. Aware of these critical challenges, I have sought to set up a distinctive development model rooted in the culture and in the specific national values of the Moroccan people – a model which also takes into account the need for positive interaction with international principles and objectives in this area. Morocco has thus managed to develop a pioneering national initiative for human development, together with ambitious programs in the field of renewable energy – especially solar and wind power generation – which are a key component of sustainable development. However, I am not here today to tell you about my country’s experience or about our achievements. I am here to make an appeal for developing countries to be treated fairly, especially in Africa, and for the development issue to be addressed in an objective manner. As you know, sustainable development is not something which can be achieved through decisions and ready-made prescriptions. Nor is there a single model in this area. Each country follows a path of its own, having taken into consideration its historical development, cultural heritage, human and natural resources, specific political circumstances, as well as its economic choices and the obstacles and challenges facing it. What applies to the West should not be used as the sole criterion for determining the efficiency of other development models; nor should one make comparisons between countries – however similar their circumstances may be – even when these countries belong to the same geographical area. Accordingly, the first call I should like to make from this rostrum regards the need to respect the characteristic values and principles of each country as it builds its own development model. This is particularly true for developing countries which are still suffering from the consequences of colonialism. Colonialism caused severe damage to colonized countries. For many years, it hindered their development process, exploited their resources as well as the energies of their sons and daughters, brought about profound change in the customs and cultures of the peoples concerned and sowed the seeds not only of division between members of the same community, but also of conflict and discord between neighboring countries. Though many years have passed, the colonizers bear a historic responsibility for the tough – and at times tragic – circumstances experienced by some countries of the South, particularly in Africa. Today, and given the adverse consequences suffered, former colonial powers have no right to ask the countries of the South to introduce radical change rapidly, on the basis of a frame of reference with which they are unfamiliar, be it in terms of their culture, their principles or their values. It is as if no development were possible other than through a single model: that of the West. This brings me to the second appeal I would like to make to the international community: more realism and wisdom are needed when dealing with these countries. There should also be greater consideration for their circumstances and the paths they choose to achieve democracy and development. Instead of providing the assistance needed by the peoples concerned, some Western countries, which asked nobody’s permission to colonize countries of the South, continue to impose on them harsh conditions which hinder these countries’ normal course towards progress. In fact, all that Western countries and their affiliated institutions do is give lessons, and, at best, a few pieces of advice. As for support, it is very limited and is always conditional. What is more, they ask the countries of the South to achieve stability and development within a very short time frame and according to specific, imposed conditions, without taking into account these countries’ development processes or their specific national circumstances. There can be no stability without development. By the same token, development cannot be achieved without stability. Both hinge on respect for the sovereignty of states, their territorial integrity, culture and customs, as well as on a dignified life for their citizens. Moreover, the rating and classification of these countries – according to current standards – raises a number of questions. The rating process has shown not only its limits, but also how far removed it is from the reality of the countries of the South and how incapable it is of giving an objective account of the level of human development achieved by these countries. As inadequate as it unfortunately is, the aid granted is often based on these ratings and their quasi impossible conditions. I therefore appeal for intangible capital to be one of the primary criteria for measuring wealth and rating nations. As clearly shown by World Bank studies, intangible capital takes into consideration a series of factors related to the living conditions of the population, such as security, stability, human resources, institutional development and the quality of life and of the environment, all of which are elements that have a major impact on crafting public policies. The evolution of countries should not be governed by any rating or classification; instead, it should be viewed as a historical process based on the positive experiences of each country; similarly, each country’s characteristics should be respected. The reference to the negative impact of colonialism does not mean we wish to put any party in the dock of a law court. This is simply an earnest call to do justice to the countries of the South by reconsidering the way they are dealt with and supporting them in their gradual march towards progress. In my address in Abidjan, last February, I insisted on the fact that Africa does not need humanitarian aid as much as it needs mutually beneficial partnerships. I also stressed that Africa needed to turn the page on the past and overcome its political, economic and social problems – that it needed to rely on its own resources to achieve its development. This is exactly what Morocco has sought to accomplish through a series of important agreements signed with a number of African sister nations. In this respect, I wish to mention, in particular, the strategic agreement signed with Gabon for the production of fertilizers for African markets in order to contribute to development and food security in the continent, which is home to a staggering 60 per cent of the world’s unexploited land. This is an outstanding model of South-South cooperation which reflects our capacity as African countries to develop the continent by relying on ourselves and investing in the natural resources of our countries. As you know, Ladies and Gentlemen, achieving development does not merely hinge on a set of projects and on funding; nor is underdevelopment synonymous with the countries of the South. The problem has nothing to do with Africans’ attributes and skills. Indeed, Africans have proven their ability to produce and create whenever the right conditions were met, and whenever they managed to rid themselves of the oppressive legacy of colonialism. Similarly, the development issue in Africa has little to do with the nature of the land or the weather, as harsh as they may be in some parts of the continent. It is more closely related to deep-rooted economic dependence, the lack of support and funding and the absence of a sustainable development model. Thus, providing aid to these countries is not an option or an act of generosity as much as a necessity and a duty. What peoples really need, though, is fruitful cooperation grounded in mutual respect. Therefore, the right conditions need to be created, in theory and in practice, to move on to the next stage with regard to promoting both democracy and development, without interference in the internal affairs of states. In return, the latter should commit to good governance. The world stands at a crossroads today. Either the international community supports developing countries to help them achieve progress and ensure security and stability, or we shall all face the consequences of more conflicts and greater fanaticism, violence and terrorism – all of which feed on feelings of injustice and exclusion – and no part of the world shall be safe. As the world grows more acutely aware of the cross-border threats posed by the lack of sustainable and human development, and as we realize that ours is ultimately a common destiny, I am sure there will be a global awakening regarding the need to work for a more secure, more equitable and more humane world.